A police officer has been cleared of any involvement in the death of a teenager in County Armagh in 1991. The police ombudsman said there was no evidence that the death of Alice McLoughlin, 16, was "anything other than a tragic accident". The teenager died after being shot in the head while she was in the car of an off-duty police officer in Portadown. 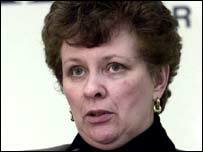 Ombudsman Nuala O'Loan partially upheld a complaint of "significant failings" in the RUC investigation of the death. She said these were particularly in forensic aspects of the investigation. "I suspect that if the forensic strategy had been more thorough it may have dealt with many of the issues which were to cause Alice's family concern over the years and have answered many of the allegations which the police officer had to face," she said. However, Mrs O'Loan rejected an allegation that the officer was responsible for the death of Alice, that he lied about knowing her and that police conspired to cover-up the relationship. The findings, published on Tuesday, followed a two-year investigation by the police ombudsman's office into the incident. Alice died on 6 July 1991 after being taken to Craigavon Area Hospital by an off-duty police officer. She had a gunshot wound to the head, caused by a bullet from his gun and was pronounced dead within minutes. The police officer said he had met Alice less than an hour earlier when he found her walking along a road. He said he gave her a lift as she appeared "agitated and drunk". The officer said he was running out of fuel and went to a cash machine to get money to buy petrol. He said that on returning to the car he drove a short distance when Alice shot herself with his gun, which had been lying in the car. The RUC launched a murder investigation. The DPP subsequently directed no prosecution of the officer, but he was later disciplined for failing to secure his gun properly. Alice's family have always disputed an inquest finding which concluded that the teenager shot herself. They went to see the police ombudsman to outline their concerns and a formal investigation was launched in December 2003. A full report on the ombudsman's investigation has been sent to the Secretary of State, the chief constable and to the Policing Board. # posted by SAOIRSE32 : 1:09 p.m.